Swedish tech blog Teknikveckan this week received information regarding an as-yet-unreleased TRDFRI smart plug expected to ship in October. 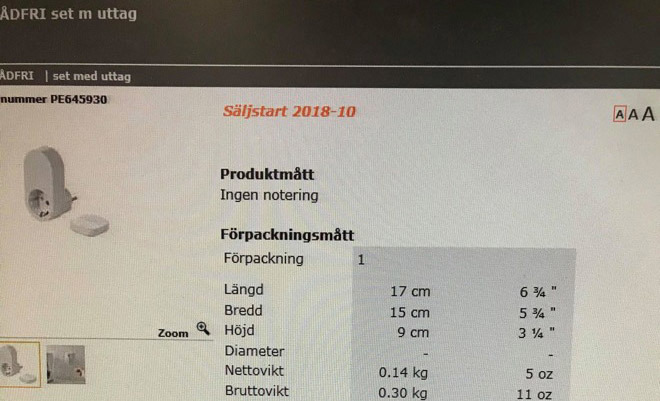 According to a screenshot of what appears to be IKEA's internal product database, the smart plug is set to arrive in October and will run only $10 for basic on/off functionality. A bundle including the outlet and a remote will cost $15. The remote features a magnetic back design for mounting with the included wall bracket, similar to the Hue Dimmer Switch. The smart plug depicted in the image looks to accommodate Europlug Type F outlets, one of two electrical outlet types used throughout Sweden. Whether IKEA plans to release an identical device supporting Type A or Type B outlets found in the U.S. is unknown. TRDFRI is IKEA's line of smart home products, primarily consisting of smart light bulbs, that come with support for Apple's HomeKit, Google Assistant and Amazon Alexa. Reviews have not been overwhelmingly positive for the TRDFRI line, with many reviewers citing inconsistent command responses. They do however remain one of the most affordable lineups of HomeKit products available. As with existing TRDFRI products, the rumored smart plug will likely require a dedicated gateway to function. IKEA has had a bumpy road with its smart home line. The company initially announced HomeKit support as part of a software update last August, only to retract those claims hours later. A second release was attempted last October, but the update was pulled after "technical difficulties" were encountered. IKEA officially added HomeKit support to the TRDFRI line in November.